So, I’ve been watching the Thai edition of hit Korean drama Full House and starring in it is Thai singer and actor Mike D. Angelo. 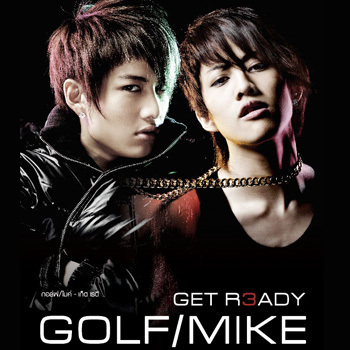 Mike is one half of Thai duo Golf Mike comprised of two brothers. Golf being the eldest. These two have done work in China and even worked with Johnny’s in Japan. I’m not 100% certain what led me to buy one of their albums on iTunes, but it was back last year or so when I had discovered Thai dramas and music. Get Ready is I think is their last full length Thai album before they started pursuing acting and solo careers. They have released a greatest hit album earlier this year. Get Ready is a good album and a big mix of genres. They do dance, hip hop, pop, and ballads. I’m not 100% a fan of every song on this album, I won’t lie, but I do like the album over all and watching Full House has be going back and listening to Golf Mike once more. In this album Golf and Mike each wrote and produced one track. I highly recommend checking out their Thai, Chinese, and Japanese releases, their albums as a duo and their solo albums. They are very talented. Although…I’m not a huge fan of some of Golf’s music…but it’s just not a genre I really like, but he does have some good solo songs. I do like most of Mike’s solo works. The opening song is a dance/hip hop song. Not my favorite on the album, but definitely not a bad opening. After the opening dance track we are hit with a beautiful ballad. This song is one of my favorites. We then go to another dance/pop song. This one is quite catchy. From pop we go to a more R&B song. These guys definitely produce diverse music. Another beautiful song. Another addictive dance track you can bob your head along to and sing along with some of the English parts. Another song that has a more R&B feel to it. Lots of English in this song. This is a dance song that I believe was part of the OST for their first drama. But don’t quote me at that. This is another beautiful ballad. I really do love their ballads and most of their pop/dance songs. Again, great ballad. The start has an R&B feel to it. Another dance song with lots of English to sing along with. I’m excited to try these songs out! After Full House I keep trying to find Thai music that I like. Not that you’d want to since the posts are evil and long, but in my monthly music posts, I always feature some new Thai discoveries that I’ve fall in love with 🙂 I highly recommend checking out Thai band Instinct. They are awesome. Plus they’ve done some collaborations with Japanese band WEAVER! I’ve been getting better and they’ve been getting smaller, lol. Still, they are quite long. I was *once* a fan of the original. I’ve tried to rewatch it multiple times but just can’t make it through the entire series again. I’m not quite sure how that works, lol. I have no problem watching remakes. Sometimes it’s hard to get over the original, but other times it all works out okay and I’m enjoying this drama with its random English conversations and Mike’s very awful phone skills. I’ll have to check out their recaps now 🙂 Thanks for letting me know about them.